In international development / global aid programs, ‘cost-effectiveness analysis’ is a term given to comparing the relative costs of achieving the same outcome using different activities. 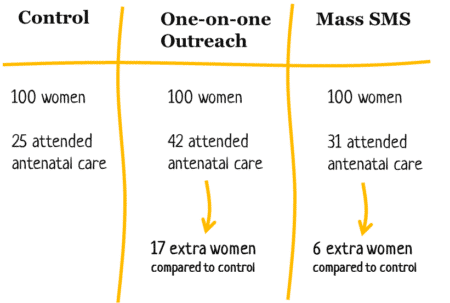 For example, if a program uses one-on-one outreach to promote antenatal care for pregnant women, and another program uses mass SMS to do the same thing, then you can compare the relative cost for each extra woman who decides to attend antenatal care. Cost-effectiveness analysis is sometimes called cost-utility analysis. It is different to cost-benefit analysis. In cost-benefit analysis, the outcome is described in monetary terms. For example, if the outcome is preventing one case of HIV you could assign a monetary value to this by adding up the average healthcare costs for an HIV patient. Then you could work out how much money the program saves for each dollar that is spent (e.g. for every $1 spent you save $5). This article describes how to do a very basic cost-effectiveness analysis for your program. For instructions on how to do a more rigorous cost-effectiveness analysis check out the Handbook of Practical Program Evaluation. The first step is to decide which outcome you will use to compare the activities. It needs to be the same outcome for both activities so you are comparing apples with apples. It also needs to be something you can measure accurately. For example, the number of toilets built, the number of small businesses set up, the number of trees planted, or the number of children who don’t drop out of school. Make sure you clearly define how the outcome is measured. For example, if it is the number of pregnant women attending antenatal care, then how many visits do they need to attend? What if they only attend some visits? Or don’t complete all the required steps? The outcome needs to be measured the same way every time. If you are comparing the cost effectiveness for two activities then you need to measure the outcome in question for both activities. Let’s continue with the antenatal visit example. Say you want to compare one-on-one outreach with mass SMS messages. First you would need one group of pregnant women who don’t receive any intervention, and you would count how many of them attend antenatal care. For example, 25 women out of a group of 100. Then you would need a second group of pregnant women who receive one-on-one outreach visits. Count how many of them attend antenatal care – let’s say it’s 42 women out of a group of 100. Then subtract how many attended from the first group (42-25 = 17). That means the one-on-one outreach resulted in 17 extra women attending antenatal care. You also need a third group of women who receive SMS messages reminding them to attend antenatal care. Count how many of them attended. Let’s imagine that it was 31. Subtract the number who attended in the first group (31-25=6), meaning that 6 extra women attended antenatal care as a result of receiving the SMS. The next step is to work out how much each activity cost. Make sure you take into account every cost associated with the activity, including the cost of the time that staff spend organising and implementing it. 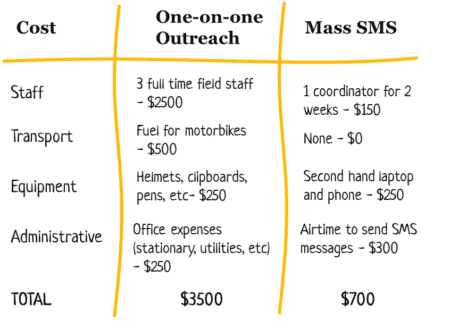 Keeping with the same example, this would mean adding up all the costs for the one-on-one outreach sessions, then separately adding up all the costs for the SMS messaging. 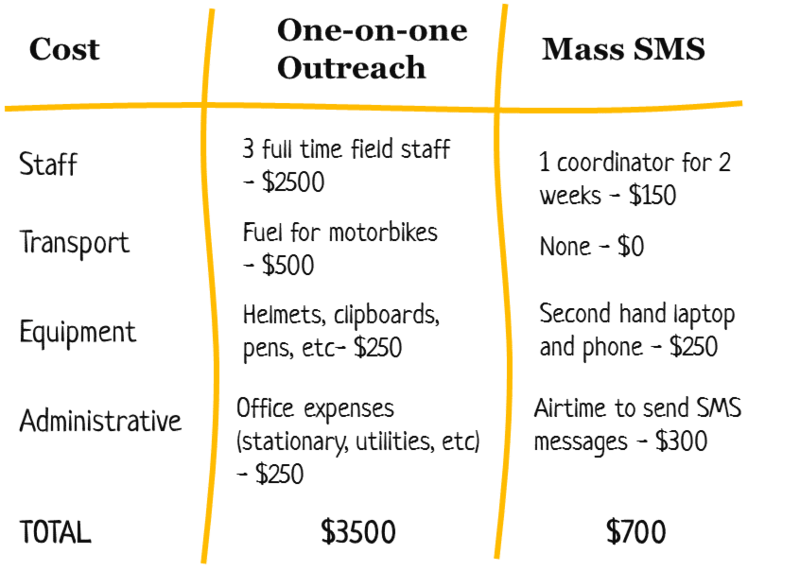 Let’s say that the total cost of the one-on-one outreach for 100 women was $3,500 and the total cost of the SMS messages was $700. To calculate the cost-effectiveness for each activity divide the total costs by the outcome. In this example that means dividing the total cost of one-on-one outreach or SMS messages by the total number of extra pregnant women who attended antenatal care. In this fictitious example, SMS messages are more cost effective that one-on-one outreach when it comes to getting women to attend antenatal care. This is a very basic method for doing cost-effectiveness analysis. It is useful when you want to compare different activities that have exactly the same outcome in order to save money. However, it’s important to realise the limitations. Cost-effectiveness analysis only looks at one outcome. In this example it was the number of women attending antenatal care. It doesn’t take into consideration other factors. For example, it’s possible that one-on-one outreach had other benefits for vulnerable women (emotional support or increased knowledge of good childcare practices) which were not provided by the SMS messages. 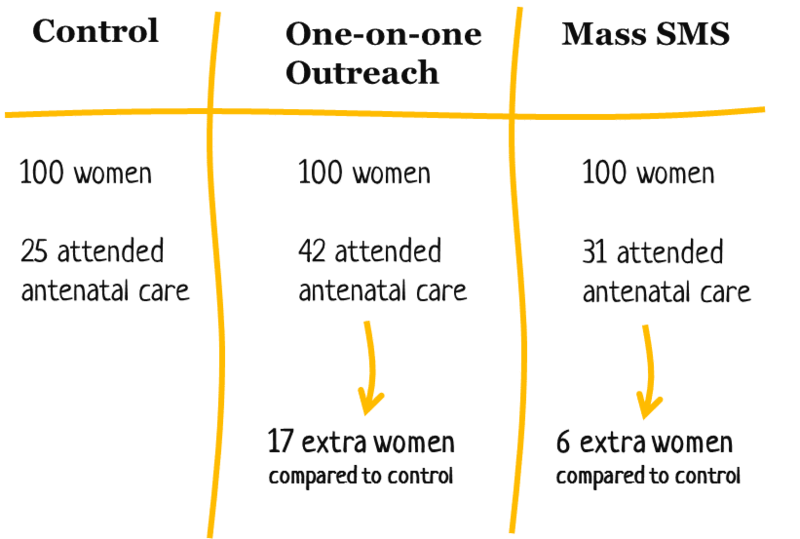 One-on-one outreach also achieved a higher participation in antenatal care, so if you wanted the maximum number of women to attend it might still be a better choice. There may also be times when it is difficult to accurately measure the costs or outcomes of a particular activity. This is often the case when multiple activities are integrated into one program, and there aren’t separate groups of people receiving different activities. In this case cost-effectiveness analysis may not be appropriate.